Like all other blogpost, this post also starts with my apology about me neglecting this blog and not posting anything here lately.Time Management is a difficult thing to do.Here is an update about my fitness plan.I am now irregular in going to gym.My weight is hovering around 78 and 79 kgs.This post is mainly to note a bad experience i had at a government office. Mr. Padmakaran who is a Joint Block Development Officer, working at Parakode owes my father Rs 35000 he has borrowed for personal use.He didn't gave back the money and atlast gave a check to cash.The check got bounced and my dad filed a civil suit in the nearby court hoping this person will give the money back as cases will affect his job and all.But it didn't happen and my father died in a heart arrest in 2008.Then my family was the plaintiff.So we pursued the case so that my father's efforts should not be lost in vain.We won the case in 2009.Now we got to make arrangements to recover the money from the salary of the Joint BDO. should be given salary certificate of the accused. Now that i am 26 year old youngster have no idea of courts (seen this proceedings now only).I am an engineer writing software codes in PHP.I have never visited a Block Office (block is an organisational office that rules above panchayat.that is wat my knowledge is. ).My first visit to a block office was disastrous.I entered the premise and asked for the office of the BDO (Block Development Officer).I had the knowledge that a BDO is a guezetted officer (person who signs with green ink and who can certify any documents of the public). 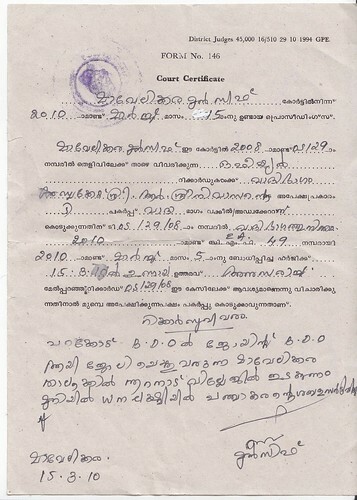 I told respectfully to the BDO about my purpose of the visit and produced the certificate.There was something wrong with the certificate.A covering letter of the advocate needed to be provided with the court certificate.The assistant of our advocate didn;t told me that, he just gave me this certificate.Now this BDO whose name is Thankappan shouted at me without any provocation from my end.I asked him about why he was not giving the salary certificate.That was the provocation for his shouting.I told him calmly that i just wanted to know the reason so that i can tell my advocate.I really don't know about government rules and laws, procedures.I am ok if he declines, but i want to know the reason, so that i can tell my advocate and make corrections. But this man was hopeless.He shouted at me like i was a pakisthani.I was very depressed.I was thinking that if a law abiding indian citizen with some basic knowledge about our country, it's democracy and setup is being treated this way, then wat about our illiterate villagers who know nothing much about what our constitution guarantees us.How this man will be behaving if poor villagers visit him for any purpose?If i am a political person of a ruling party or in a government position above him, will he behave in the same way? The problem is our babus, who should be serving us for which they are given hefty salary, are acting as they are our masters.People like Thankappan should know that East India Company is not ruling India.I couldn't say that to him because i got to get the certificate once i get the covering letter. I called my lawyer and asked him.He asked me to come over there and show me the certificate again,I got to visit my advocate he told me that the court certificate needs to be given along with the request from the advocate and his assistant forgot to give the covering letter along with the certificate.So i got to get a covering letter and visit this ******* BDO Mr. Thankappan again.I do not expect better behaviour the next time also.When i am writing this, i got the covering letter from my advocate.Again, i will be going afor the certificate next week probably Monday. I understand that the BDO's subordinate who owes us money might be his friend also.This man would have enemity against me since i am running a civil case against his subordinate.That might be the reason why he shouted and insulted me.
" Why couldn't you tell me the reason in short rather than shout and insult me?" You got to grow up.Is this the impression you are creating in a youngster you meet the first time in your life.You know nothing about him.Do you think that the throne you are on is everlasting and is the best one in the world?Even Saddam Hussain thought like that. He is the public information officer of the office under the RTI act.I doubt his ability to provide information.As far as the information i gathered in that hour,he is only good at shouting. You do not become big by shouting and insulting.You become small only.I have seen officers in bigger posts than you.Most of them behaved very well. WILL UPDATE MY EXPERIENCE WITH THE PUBLIC SERVANT ONCE I SUBMIT THE CERTIFICATE AGAIN BUT THIS TIME WITH A COVERING LETTER APPLICATION.